The founder and CEO of Street Basketball Association (SBA) Mr. Jerrod Mustaf, in the country for a week's visit as special guest of H.E. 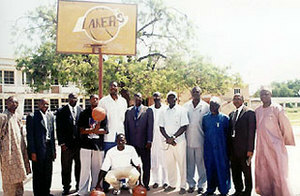 the President Jammeh in a bid to introduce street basketball in the Gambia. Mr. Mustaf met the Gambian leader during his audience with the Gambian community living in the US in New York at the end of the UN General Assembly held in September 2005 in New York. 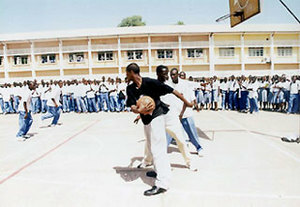 Street Basketball Association (SBA) is an organisation founded by Mr. Mustaf in the United States designed to improve youth basketball through playing in the streets and parks. It also incorporates music in the game in the form of the hip-hop giving the game a new face loved by youths. It is in this light that Mr. Mustaf visits the Gambia to introduce street basketball in the country and improve the game which is mostly played in the greater Banjul area and Brikama. According to Mr. Mustaf, he wants to concentrate in the meantime on grassroots basketball with the view to develop the game. He paid a courtesy call on the SOS for Youths, Sports and Religious Affairs Samba Faal where they discussed at length the prospects of street basketball. 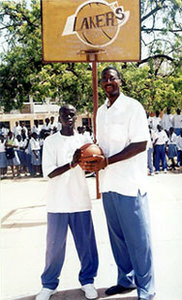 Mr. Mustaf, who is accompanied by Patrick Robinson, a member of Street Basketball Association (SBA) visited senior secondary schools in Banjul, the Independence Stadium, Manneh Sillah Memorial Court, and the Youth and Sports Department as well as the exective of the Gambia Basketball Federation went around the schools to introduce street basketball. Patrick Robinson who has ball joggling abilities, entertains students which has inspiration to basketball lovers. Basketball clinics will be held in schools and at the Manneh Sillah Memorial Court which senior and junior players will attend. Mr. Mustaf returns home on Thursday November10.